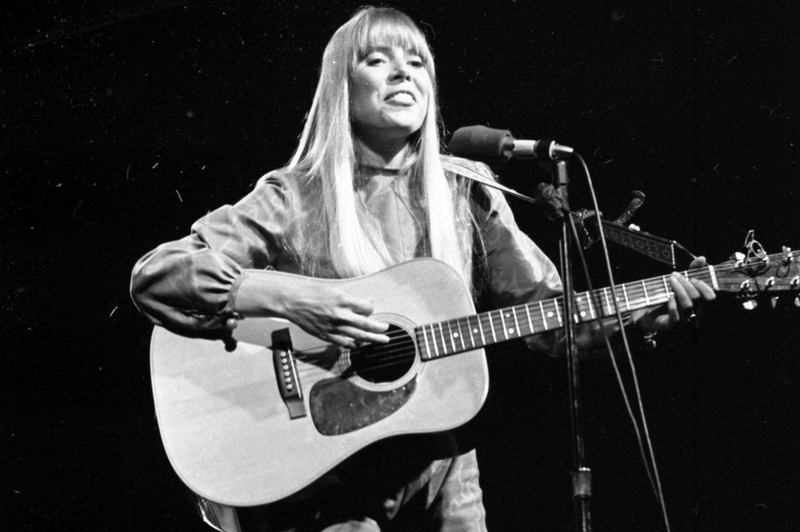 "I was so feminine then," Joni Mitchell tells author David Yaffe, looking back to the late 1960s. "I'm my own man now." Over the course of a singular career and in her private life, she would need to be. Yaffe's new book is Reckless Daughter, a sympathetic profile of a complicated icon and fierce genius. A professor of humanities at Syracuse University and a music critic well versed in jazz and Bob Dylan, Yaffe thoughtfully details the albums, lovers and idiosyncratic musical progression of a seminal singer-songwriter, expressive painter and dedicated cigarette smoker. What emerges early in Yaffe's book is the testosterone of the times. Mitchell attracted Svengalis like bears to honey: "She was a young woman dodging male authority in a man's world," the author explains. The ingénue's debut album in 1968 was advertised on Sunset Strip billboards with slogans such as "Joni Mitchell is 90-per-cent virgin." Yaffe keeps things male orientated by mostly using quotes from folks with Y chromosomes - although he did interview Mitchell dozens of times - and by fully detailing the men and muses of Mitchell's healthily heterosexual life. Romantic partners included (but were not limited to) David Crosby, Graham Nash, Sam Shepard, Leonard Cohen, James Taylor, Jackson Browne, John Guerin, Don Alias (who allegedly beat her), husband Larry Klein and possibly/sort of Warren Beatty. Mitchell, who on her radio hit Help Me from the summer of '74 rhymed "love again" with "trouble again," tells Yaffe that most of the men she met of her generation were "narcissistic, fair-weather types." Although born in Alberta and raised in Saskatchewan, Mitchell's training ground as a performer was in Toronto. Yaffe doesn't spend a lot of time on her Yorkville days, but does throw fans of folk-scene Canadiana a few bones, including anecdotes about Mitchell's frustration with Gordon Lightfoot (who had no advice for her) and a dry-witted club owner. It's not in the book, but a review in The Globe and Mail in 1967 was strikingly dismissive. Referring to a quip from Mitchell at Toronto's Riverboat club about having blues in her repertoire, writer Peter Goddard scoffed, declaring that for Mitchell, the blues were "the contented blues of a well-bred, well-heeled, well-informed ex-Saskatoon female folk-singer." Mitchell was born Roberta Joan Anderson in 1943, the lone child of conservative parents Myrtle and William. The former, as Yaffe tells it, was unhappy in marriage and motherhood. The line in Mitchell's The Tea Leaf Prophecy came from Myrtle's advice to her only daughter: "Don't have kids when you get grown." At the age of 10, she (and Neil Young) survived a polio epidemic that left her with a weak left hand that eventually resulted, according to Yaffe, in Mitchell's innovative guitar tunings. Mitchell believed her parents' judgment to be unsound, and blames her overbite on them. "So," she tells Yaffe, "I had to be my own person very young." She fled the Prairies pregnant with a baby she would give up for adoption while living in Toronto in 1965. Soon after, she married and fairly quickly divorced Chuck Mitchell, an American folk singer who was not in her league musically. Mitchell describes her first husband as her "first major exploiter," but there was probably some exploiting being done on both sides - a point Yaffe fails to raise. Indeed, the author is firmly on Mitchell's side. When he does bring up her spitefulness (as it pertains to fellow folk sirens Joan Baez and Judy Collins), it is presented without comment. The book is in-depth: Yaffe's album-by-album analysis of Mitchell's work is adroit, if geared more to musos than Joni-music beginners. Interspersed with the chronology of her lovers and ever-evolving music, examples of her butting up against patriarchal nonsense never stop coming. For her romances, Rolling Stone magazine dubbed the Los Angeles-based Mitchell the "Queen of El Lay." In 1969, Mitchell was not among the "half a million strong" at Woodstock because record man David Geffen pulled her back from making the trip. He suggested the boys (Crosby, Stills, Nash & Young) go on without her. Staying behind in New York, she wrote the song Woodstock, which became a hit counterculture anthem - for CSNY. A late chapter is given to Mitchell's difficult reunification with the adult daughter she gave up as an infant. The book ends with her 2015 brain aneurysm that has severely weakened Mitchell, now 74. Among her first words after the trauma was a request for a cigarette. With Reckless Daughter, Yaffe offers a compelling portrait of an immodest woman who sang the blues - written in her own blood. We read about an artist full of ego (at times in her life, enhanced by cocaine), and one who relies on a "jive detector" set to its most unforgiving level. Intimidating, in a word. The Both Sides, Now singer opened up her chest and let us look inside: He-men such as Kris Kristofferson and Johnny Cash told Mitchell she was giving up too much of herself. But she wrote for truth, not pity. Now give the woman a damn cigarette. Brad Wheeler is a reporter with Globe Arts. This article has been viewed 1,381 times since being added on November 10, 2017.